Cats are all the rage these days, but in the town of York, England they have been celebrating felines with a tradition of public cat statues for over a century. 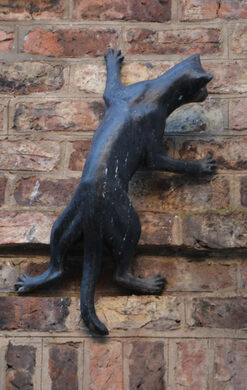 With a strong concentration in the city center, the cat statues of York are scattered on eaves, rooftops, and chimneys all around the town. The original pair of metal felines date roughly to the turn of the century, and it is believed - though it’s likely apocryphal - that they were designed to scare the rats from the nearby river. Then, in the 1980’s, architect Tom Adams commissioned sculptor Johnathan Newdick to create several new cat sculptures, and use the historic originals as inspiration for a new town tradition. Adams placed a cat sculpture somewhere on each of the buildings he designed in the area and soon other business and building owners started following suit, creating a new identity for the town and a small cottage industry of cat-related tourist shops. There are now 22 cat sculptures throughout the city and many businesses offer maps of the “York Cat Walk.” However due to constant theft and new additions to the public collection, many of the mousers listed on the maps prove as elusive as any real cat.